Traditional meetings can easily get stale and ineffective. That’s because most gatherings don’t leverage our ability to process information visually. Did you know that humans process visual information 60 times faster than text? Fortunately, there’s an easy way to transform your next meeting: use the power of visual storytelling to keep people engaged and make your meeting more productive. What is visual storytelling? It’s a process of graphically recording your meetings for better comprehension and awareness. 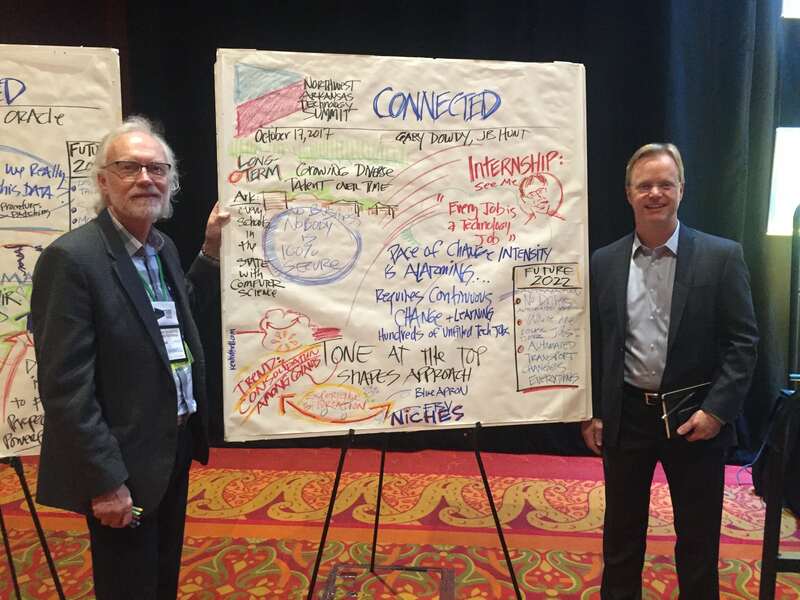 Usually, a graphic facilitator — think “a business consultant who can draw” — joins your meeting and captures important points, imagery, and messages in a hand-drawn graphic. At the end of the process, you have a visual representation of the whole meeting. It’s easier to share than a video, takes only moments to review, and provides a connected overview of information that’s hard to get from a long report. Visual storytelling can take the form of a large, wall-sized mural, an illustrated book with takeaways, a website landing page, or time-lapse videos of drawings. Here at ActionCraft, we’re focused on using tools like visual storytelling to help teams be more effective. Many businesses and teams aren’t taking advantage of this yet, but Northwest Arkansas companies are seeing the benefits of visual storytelling. Here are three gatherings that used visual storytelling and how it helped their mission. During the Bentonville Chamber’s annual meeting, ActionCraft created drawings of each presentation, using them in time-lapse videos, instant webpages for annual meeting, and an illustrated takeaway workbook with strategic summaries and followup action prompts. 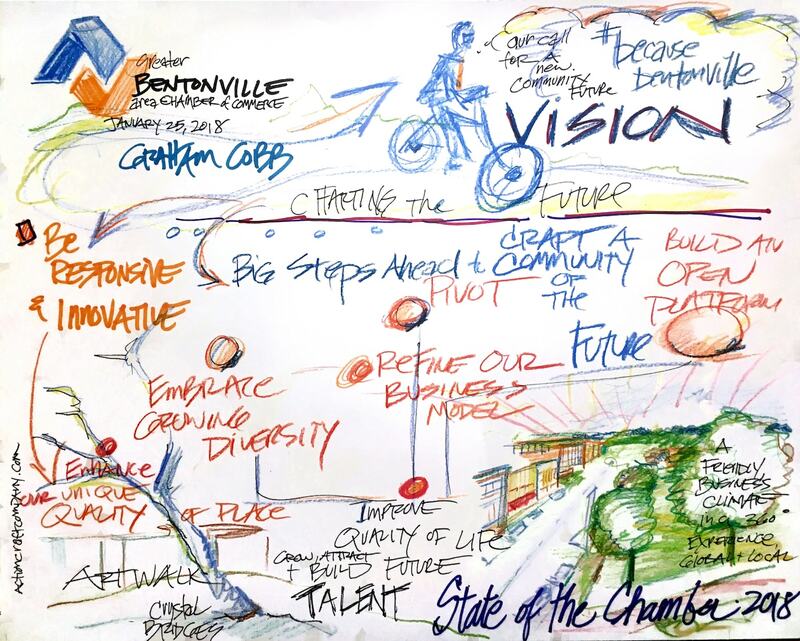 The Bentonville Chamber made both of those available online, linked to them from the website, and emailed the illustrations out to all the chamber members so they could see and experience Bentonville’s messages and vision. They’re still promoting these images on their website as a way to simply illustrate the new vision of the chamber. 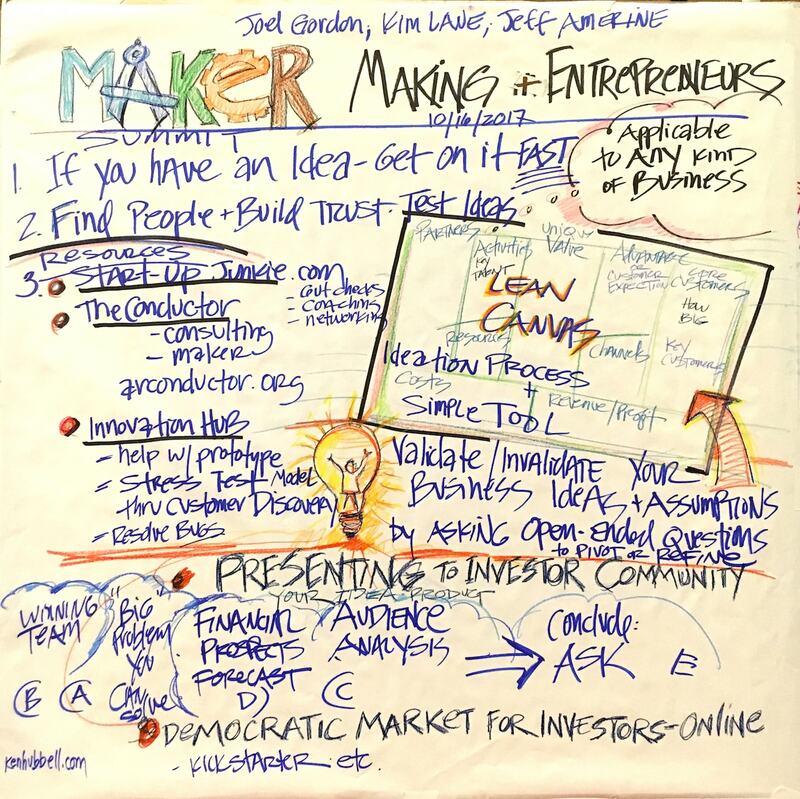 This 1.5-day conference about the makers movement in Arkansas used visual storytelling to capture and share presentations. They used large murals for end-of-day reflections after each breakout session. They even shared these murals with participants at an annual technology summit in the same facility as a way to bring the content from the maker’s summit to a wider audience. The murals showcase different dimensions of craft, tech and entrepreneurship. The annual Northwest Arkansas Tech Summit discusses innovation at the intersection between technology and business. ActionCraft brought visual storytelling to different, inspiring gatherings through large murals crafted live and used during the day to enhance and reinforce the messages of the summit. These murals were placed outside in the hallways after they were completed, letting other attendees explore them while networking in the halls. Northwest Arkansas Technology Summit 2017, J. B. Hunt Chief Innovation Officer, Gary Dowdy, presentation on how firms navigate threats and opportunities with connected people across a connected world. Ken’s murals were included in the hallways during the conference. ActionCraft is partnering with corporations, nonprofits, chambers of commerce, and other organization in the Northwest Arkansas area. We’re ready to add dimension, instant takeaways, strategic and visual synthesis to any gathering. Get in touch with our graphic facilitators if you want to add inspiration to your next important meeting.